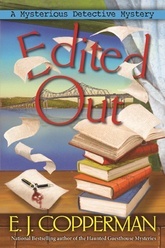 Mystery author Rachel Goldman's fictional sleuth, Duffy Madison, has somehow taken flesh-and-blood form and is investigating missing person cases not far from where Rachel lives. And Rachel's none too happy about it. Worse, when he shows up at her door and insists on talking to her, he's trying to recruit her into doing the one thing she least wants to do: Find a missing person. But the man Duffy seeks this time around may be able to solve Rachel's problem: He may be the man Duffy was before he became Duffy five years ago. But will her character-come-to-life cause her to fall victim to the blue-pencil-of-death? Filled with uncanny intrigue and witty humor, the second Mysterious Detective novel will delight cozy fans.